Do you want to receive weekly emails and stay up to date with all the automotive action on in our great state, Victoria? It’s as simple as sending me your email via this subscriber’s form and you’re done! You’ll receive no spam, your email will not be passed on to anyone and you’ll receive weekly emails keeping you informed as to what events are coming up! 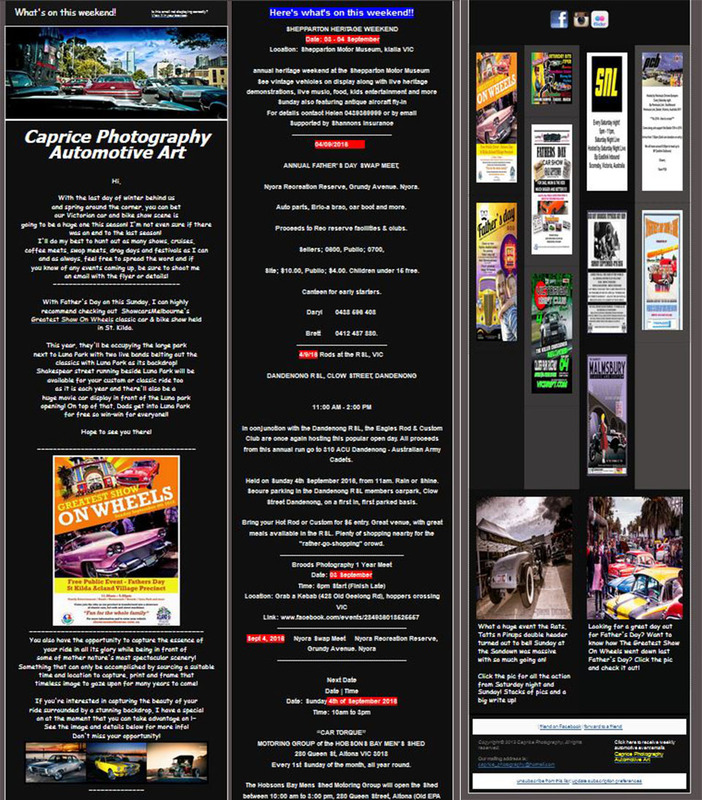 Everything from cruise nights, car shows, rockabilly festivals, burnout comps, drag racing, truck shows, bike shows, swap meets and any other automotive based event I come across will be added into an email and sent to you completely for FREE! Join hundreds of others already on the list picking and choosing how they’re going to fill out their weekend cruising in their pride and joy! It’s easy to join! Just check out the sign up page! You’ll be hooked up before you know it! If you have an event you’d like me to add to the email, simply contact me and send me the details! Digital flyers are great but text info is good too!